The content you share on your Instagram account won't get a lot of likes if nobody sees it. In order to increase the visibility of your posts on Instagram, you should strive to find the best time for sharing a post. The rule of thumb says that the best time to share a post on Instagram is when the majority of your followers is enjoying their free time because that is when they are most likely to use this social media platform. Generally speaking early mornings, lunch hours and evenings between 19:00 and 21:00 are the best times for posting on Instagram, but each year the best time for posting on Instagram changes. Things are further complicated by the fact that each Instagram account has a unique set of followers, which means that the best time to share a post on Instagram may be different for two relatively similar accounts. In this article, we are going to show you how to find out when is the best time to post on Instagram, and we are going to recommend a few scheduling tools you are going to need if you want to make sure that your posts are always perfectly timed. There is no recipe for success, but following certain guidelines can be useful if you want to extend the reach of your posts on Instagram. Despite the fact that social media researchers often come up with conflicting reports regarding the best time to share a post on Instagram, most of them agree that Mondays and Thursdays are the best days to post new content on Instagram. Furthermore, several research studies suggest that Mondays are the most effective and that posts shared on this day of the week create better engagement and have better conversion rates. Thursdays, on the other hand, are the most popular day for posting content on Instagram, which suggests that your posts will have a better reach if you share them during the peak hours on this day of the week. Nevertheless, there are no strict guidelines regarding the hours of the day, when it is best to post new content to Instagram on these days, but the time frame between 15:00 and 16:00 should be avoided during the working days of the week. Instagram's algorithm favors posts that get a lot of likes and comments, but it also factors in the amount of time it takes a post to get those likes and comments. In this manner, the algorithm recognizes high-quality posts and shows them to even more Instagram users. Coming up with the ways in which you can use the Instagram's algorithm to your own advantage and discovering the best time to share a post on your account is not an exact science. However, there are certain general rules that apply to nearly all Instagrammers. This is a fairly simple rule that suggests that you should know your Instagram followers well enough to post for a time zone in which the majority of them lives. If your target market is in Asia or North America, then you should schedule posts for peak hours in their time zone, even if that means that you have to share posts in odd hours. Even though the differences in the engagement percentages of posts shared on weekends and weekdays are marginal, the statistics show that posts shared on Instagram on a Sunday drives less traffic than the one shared on a Wednesday or a Thursday. We all lead busy lives and most of us don't have the time for social media during the working hours. 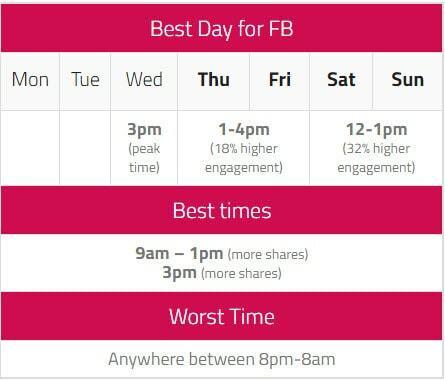 The period between 13:00h and 14:00h is a popular time for sharing posts on Instagram, but posting a photo or a video to this social media platform between 19:00 and 21:00 pm will produce the best results. Finding the best time to reach your followers is going to take a certain amount of time until you finally come up with the best time to post on Instagram. Statistics can only partially help you in this endeavor since each account on Instagram is different and each company has different demographics, targets different markets and has different goals for their social media marketing campaigns. Your own experience will tell you when the best time is to share a post on Instagram because you'll be able to see when the posts that got the most attention were shared. Following the what the experts and their studies are saying blindly is not a good strategy because you can' know how big the test group was or what were the findings of a study based on. Define your target group, and learn as much as you can about the people you are trying to reach. Who are they? Where do they live? College students have very different lifestyles than the people working 9 to 5 jobs, so an Instagram account that offers sports gear to young people will naturally have different peak time than the account that sells office equipment. The more you learn about the habits of your Instagram followers the easier it gets to find the best day and time to post on your Instagram account. Experimenting and trying to post on Instagram at different times, will show you when the best time is to share a post on your Instagram account. Once you find the peak hours for your Instagram account, you can use tools that enable you to schedule posts. However, sharing posts at the exactly the same time every day can be counterproductive, so in order to ensure the growth of your Instagram account, keep an open mind and try out new things from time to time. Recently, Instagram has introduced the Schedule option that allows you to schedule posts in advance directly from the platform. This feature is still relatively new, which is still better to use some of the apps or computer software that remind you to share a post at a certain time. Publishing posts on Instagram can be time-consuming, which is why a software like Agorapulse can help you organize your publishing schedule and reduce the amount of time you need to share a post on your Instagram account. There are several pricing plans available, while the Agorapulse app can be downloaded for free from the Google Play store. This application posts your photo and videos to Instagram automatically. To make things even better Schedugram converts your content to the right size and format for Instagram. All you have to do is upload the images and videos and choose the best visual solution for your Instagram posts. This service is available for only $20 per month for one Instagram account, and the possibilities it provides are nearly limitless. The number of options this tool for scheduling social media posts provides is staggering. Later enables you to schedule posts across different social media platforms, such as Twitter, Facebook or Pinterest. Individuals can use Later for free, while large marketing teams can use it for just $49 per month.